A Baltimore County man has established a record by catching a 2.07 pound fallfish, marking the first time this freshwater species has been recognized by the state. 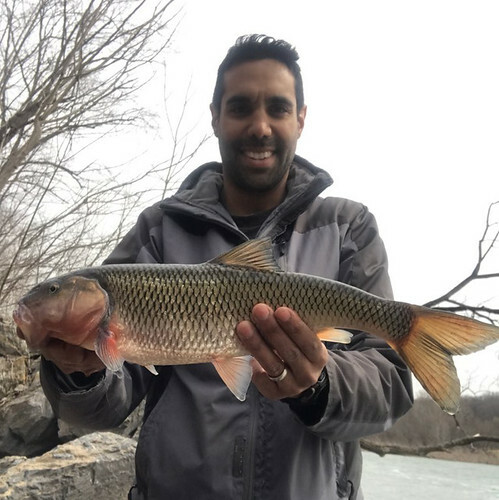 Adam Aghion of Pikesville caught this impressive fallfish March 20 on the Maryland side of the upper Potomac River, using a drop shot rig with a #12 hook. Aghion said he made the trip to that location specifically to catch walleye. Aghion’s catch was weighed and certified by Seven Mile Market in Pikesville and verified by the Maryland Department of Natural Resources. Staff reviewed other mid-Atlantic and northeastern states’ recognition of fallfish records and discovered that Aghion’s catch was in the same size range. The department then determined the species should be added to Maryland’s Nontidal record category as well. “Including fallfish in our state record category gives anglers another opportunity to be a part of our state’s angling history,” Fishing and Boating Services Director David Blazer said. The department maintains state records for sport fish in four divisions – Atlantic, Chesapeake, Nontidal and Invasive – and awards plaques to anglers who achieve record catches. Fish caught from privately-owned, fee-fishing waters are ineligible for consideration. Anglers who think they have a potential record catch should download and fill out the state record application and call 443-569-1381 or 410-260-8325. The department suggests fish be immersed in ice water to preserve weight until it can be checked, confirmed and certified.